Sticky Fingers: DIY Duct Tape Projects by Sophie Maletsky. Review: Imagine that you are a duct tape wizard. How fast could you make purses, pencil cases, bags and anything else you wanted? If you want to improve on your duct tape use, then you should read Sticky Fingers by Sophie Maletsky. This book teaches you the best tricks and tips to make the coolest duct tape creations. Sophie makes the duct tape book so interesting that everyone needs to get a copy. Sticky Fingers is a step-by-step duct tape book that helps you learn how to make duct tape projects. It is a must read book, and it could be yours! It's easy to pick up and hard to put down. The book Sticky Fingers is a nonfiction book for simple to advanced duct tape projects. It even has a whole section for the last bit of duct tape on the roll. The projects vary from making pencil cases to making a full duct tape backpack! Making a duct tape would be great fun on a rainy day or anytime you're free. Also Sticky Fingers has tons of other great projects like wallets and purses. How would you like to learn how to make your customizable wallets or purses? The projects all have level ratings and the time amounts it will take you to complete the project. This book also includes instruction for how to organize your duct tape in the best ways you can think of. This is a tip and tricks book for duct tape lovers! I love this book, and I think all of you will like it too. This book is great for ages 6 and up. It will inspire you to create your own types of great duct tape projects. This book has many fun and amazing things that I could not think of. Every little kid should own this book. I give it 4 stars for the creativity and the awesome descriptions that little kids would understand. I think it has awesome projects that you will be amazed with. Little kids would also understand what the author is trying to tell them, especially all the tips. Enjoy the book Sticky Fingers! Review written by Olivia (6th grade student). 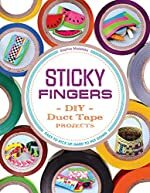 We would like to thank Houghton Mifflin Harcourt for providing a copy of Sticky Fingers: DIY Duct Tape Projects for this review. Have you read Sticky Fingers: DIY Duct Tape Projects? How would you rate it?